Why an H.P. Lovecraft Festival? 3rd Why an H.P. Lovecraft Festival? Howard Philips Lovecraft, 1890 – 1937, stormed into my life through a battered book found in my local library in the mid 80’s and nothing has ever been the same. Like many in Sweden I owe a debt of gratitude to Sam J. Lundwall and his publishing efforts. I’ve had my life reshaped by literature a couple of times after that. The writings of Franz Kafka, William S. Burroughs, Poppy Z. Brite, Neal Stephenson, Mike Mignola and Jorge Luis Borges are a few of the names that spring to mind. 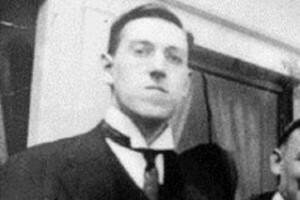 But Lovecraft’s writings about cosmic horror and humanity’s insignificance in the larger scale of things shook my young self to the core. 28 odd years on I’m still reeling from the effects. Stories such as ”The Colour Out of Space”, ”The Whisperer in Darkness” and At the Mountains of Madness transcend their pulpy origins, the limits of genre and language reaching something beyond the base matter from which they are built. Like many writers in our literary canon, Lovecraft’s texts staked out a territory that may not be easy to traverse. But those who take the time and have the fortitude to push through the at times asphyxiating flow of adjectives will find something that just might change their view of the world. Through the years many have heard the call and felt the need to expand upon the mythology Lovecraft sketches out in his stories. Already before his life was cut short, this was a literary game played by many of his pals and fellow contributors to Weird Tales Magazine. Robert E. Howard, Clark Ashton Smith and Frank Belknap Long all coined names in the vein of the famous Cthulhu and put new tomes in the library of deadly grimoires where Necronomicon stands in a place of honour. Lovecraft encouraged this and was amused that so many people found something worthwhile in all the ”Yog-Sothothery”, as he referred to the stories involving his fictional pantheon of Elder Gods. I don’t think the irony escapes anyone that stories at times rife with misanthropic nihilism were created in such a spirit of welcoming camaraderie. His approach is probably as far away from today’s franchise protective media environment as it’s possible to get. Apart from the sheer force of imagination in his stories, I think that this openness accounts for much of the wide cultural impact that the gentleman from Providence continues to have to this day. You can see interpretations and traces of Lovecraft’s work in nearly all disciplines of the arts. I’m still waiting though, with some trepidation, for a modern dance company to pitch in. When striving to present a multifaceted and rewarding festival experience, who could ask for more? So I tip my hat to all contributors, friends and family who have weathered the storms of producing this event with me. And I hold out a hope that many reading this will join us in celebrating the life and work of Providence’s foremost son Howard Philips Lovecraft. Anders Lundgren, Festival General, The Stockholm H.P. Lovecraft Festival.